Published in the UK by Penguin today, the 10th January 2019. A tender, devastating coming-of-age debut novel about friendship, innocence and war. The end of the school year is approaching, and siblings Paddy and Liz McLaughlin, Christy Meehan, Kevin Thompson and their friends will soon have to decide what they're going to do with the rest of their lives. But it's hard to focus when there's the allure of their favourite hangout place, the dingy 'Cave', where they go to drink and flirt and smoke. Most days, Christy, Paddy and Kevin lie around listening to Dexys and Joy Division. Through a fog of marijuana, beer and budding romance, the future is distant and unreal. But this is Derry in 1981, and they can't ignore the turmoil of the outside world. A friend is killed, and Christy and Paddy, stunned out of their stupor, take matters into their own hands. Some choices are irreversible, and choosing to fight will take hold of their lives in ways they never imagined. With humour and compassion, Geraldine Quigley reveals the sometimes slippery reasons behind the decisions we make, and the unexpected and intractable ways they shape our lives. 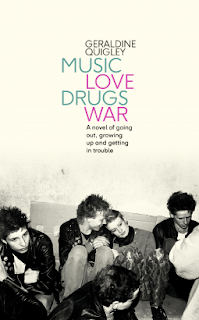 For anyone unconvinced of the need to Not build a new hard border between Northern Ireland and Eire, I think Music Love Drugs War should be required reading over the next few weeks. Set in early 1980s Derry, Quigley's novel is essentially the story of how a group of teenagers deal with the usual angst of leaving school and entering into adulthood. The story mostly follows the boys of the group as the girls' options - other than potential university student Liz - are already restricted by social customs and expectations. For the boys however there are the competing appeals of signing on, taking a drudge job, or maybe leaving the country in search of a real opportunity. There is also the shadier course of joining the IRA and discovering a cause worth dying for. I loved Quigley's portrayal of daily life in 1980s Northern Ireland. Much of the mundane detail wasn't far removed from my own experiences as a child in 1980s England, but the constant violence and lack of trust between communities and even between households in Music Love Drugs War was shocking to read about. I was reminded of Asian novels I have read (Entangled Lives by Imran Omer sprang to mind) where directionless young men are turned towards violence and an almost-religious fervour for a cause on lieu of genuine personal prospects and a sense of a future for themselves. These fictional characters are shown believing that their contributions are making a difference yet, as the novels show a wider view, we as readers see them as disposable pawns in a much larger scheme. I felt that Quigley had a real understanding for her characters and their motivations. I appreciated her evocation of the historical period too, especially the weaving of real events into the fictional tale which never felt forced. I can't imagine how stressful emotionally it must be to live in a country under occupation. Reading the scenes of British army personnel randomly stopping people in the streets or marching in and searching homes almost apparently on a whim helped me to clearly see how it wouldn't take much more provocation, after years of such treatment, to push these boys into 'fighting back', especially when alternative choices are limited. What I found particularly effective was Quigley's presentation of attitudes and reactions from all parties. The boys might envisage themselves as potential heroes and martyrs, but how difficult must it be for a parent to actually see exile as a better option for their child? I just can never go near a book that in any way glorifies terrorist activity and groups. I was in college in the '80s and the troubles in Northern Ireland and the actions of the IRA came up in conversation, when we were hanging out in the student lounge, on a semi-regular basis. The fighting and bombings were in the news all the time even here in the US. It sounds like it was an enlighting read. This one is set in such an interesting time and it sounds like the coming of age storyline is handled well. I think there is a lot to learn about the Northern Ireland situations - especially as to me because I have not looked into Ireland and its history too much even though it is so close to the UK. This could be a good way for me to do that. This is a strong coming-of-age story in its own right, plus it has the fascinating historical setting too. And it does feel weird for me to be calling the 1980s 'historical'!